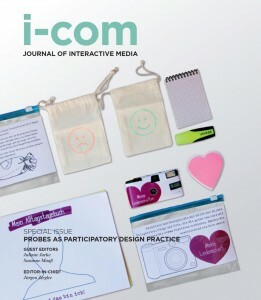 I a m delighted to announce that the Special Issue on Probes as Participatory Design Practice which I co-edited with Susanne Maaß has been published. The special issue is interested in some of the fundamental questions of participatory design: How future users can be involved in design processes in meaningful, empowering and creative ways. The particular focus is on the ways in which (cultural) probes may serve this purpose and can be understood as participatory design practice. The concept of cultural probes was developed by Gaver, Dunne & Pacenti (1999) to collect ideas for creative design solutions from prospective users: A set of materials and questions stimulate users to observe, document, reflect and comment on their own everyday life over a certain period. Examples for such probes are diaries, cameras, postcards or maps. As a means of writing ethnographic self-description and self-disclosure and in combination with interviews or group discussions, they allow to communicate insights into everyday processes and structures, which are difficult to observe or investigate otherwise. Since their first introduction, cultural probes have enjoyed increasing interest in the field of human-centred or user-oriented software design. The concept has been amended to include concepts such as “design probes” (Mattelmäki, 2006), “technology probes” (Hutchinson et al., 2003) or “mobile probes” (Hulkko, Mattelmäki, Virtanen, & Keinonen, 2004) amongst others. All i n all, the special issue features five papers that analyse and discuss the use of probes in participatory design contexts, how users may be involved and empowered to design, contest, interpret and reflect on probes; how probes may inform a participatory design process. My colleague Ulrike Gerhard and I have contributed one paper on the use of probes in sharing (tacit) knowing between designers and participants/users and amongst participating users. The paper is based on our research and innovation project MobileAge and is available as open access.